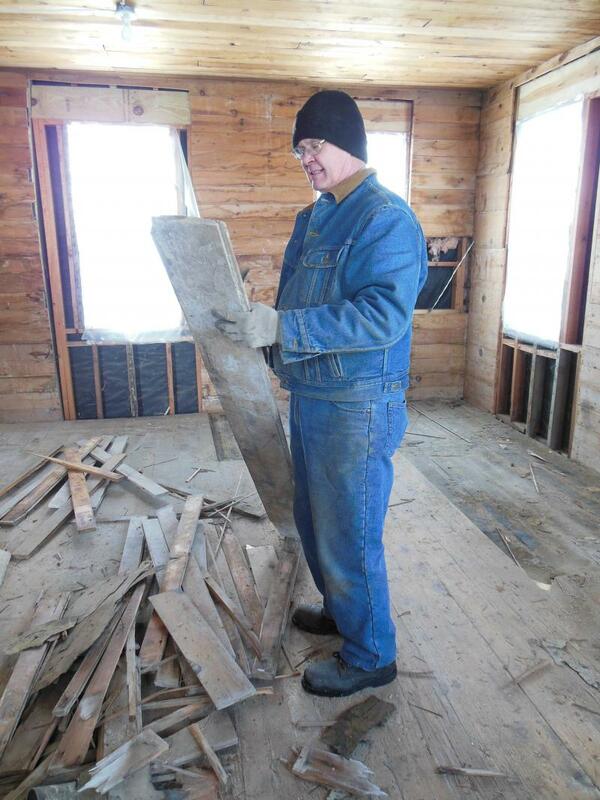 Over the past several months, volunteers have been working on several important projects. Check out the pictures below to see whats happening. Remember to check back often to see the progress! 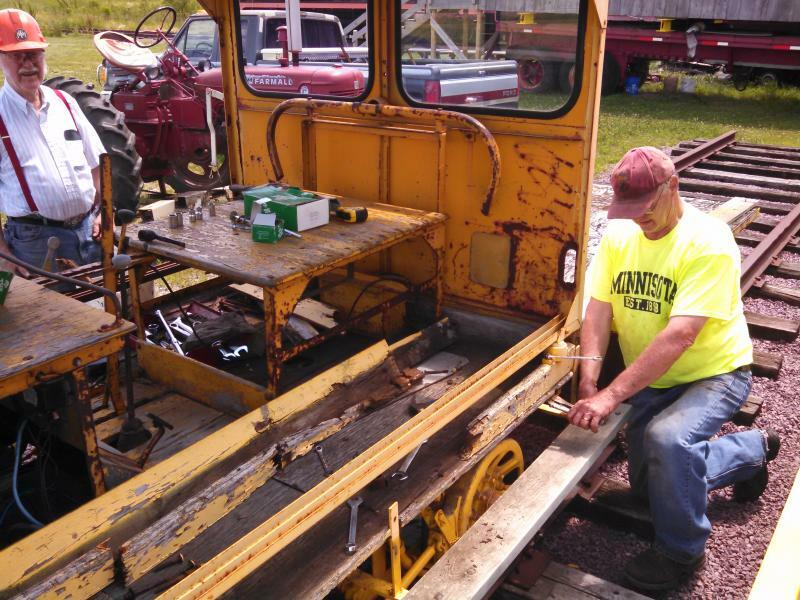 Volunteers have been busy giving the Milwaukee Road caboose a much needed make over. Soon the faded orange, now almost pink paint will give way to bright orange once again. 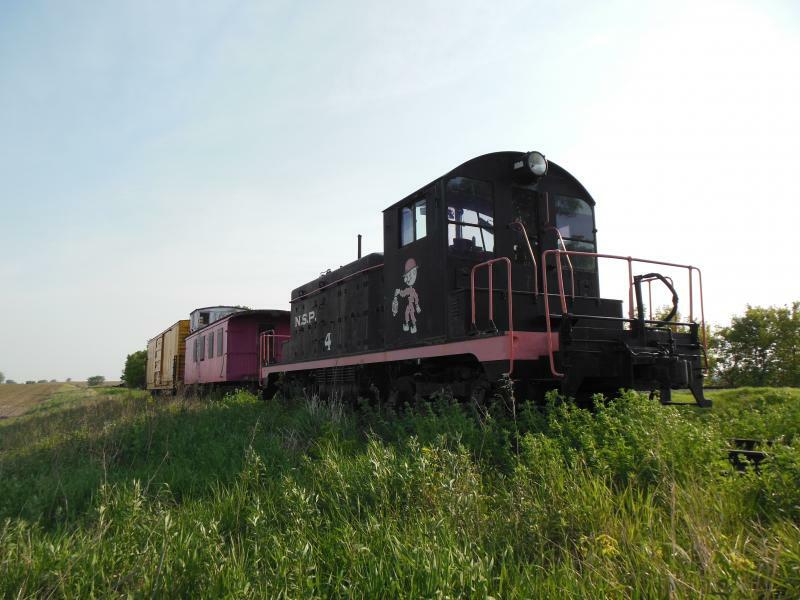 Milwaukee Road 992147 is used as part of GSRM's caboose train and was put back into operation in 2016. Its restoration is ongoing. Check back to see the progress on the project and come out to the museum for a ride! Volunteers got both sides of the caboose painted by Dozinky Days weekend, Sep 15/16/17. One more coat of orange, then on to the safety yellow ends. 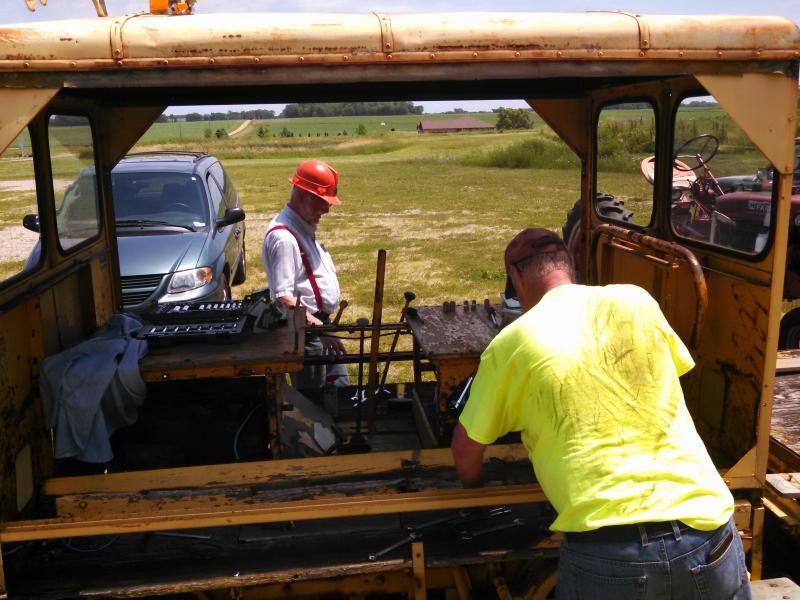 During late June and early July 2016, volunteers replaced rotted wood floor boards on the Minnesota Transfer speeder on display in front of the Hill Top depot. The speeder flat also got a much needed coat of orange paint. This fall or next spring, the Fairmont motor car will also get a coat of orange paint. The speeder isn't operable and forms a static display in front of the depot. It's fun for kids who have never seen one and enjoy climbing on it and sitting at the operator's controls. 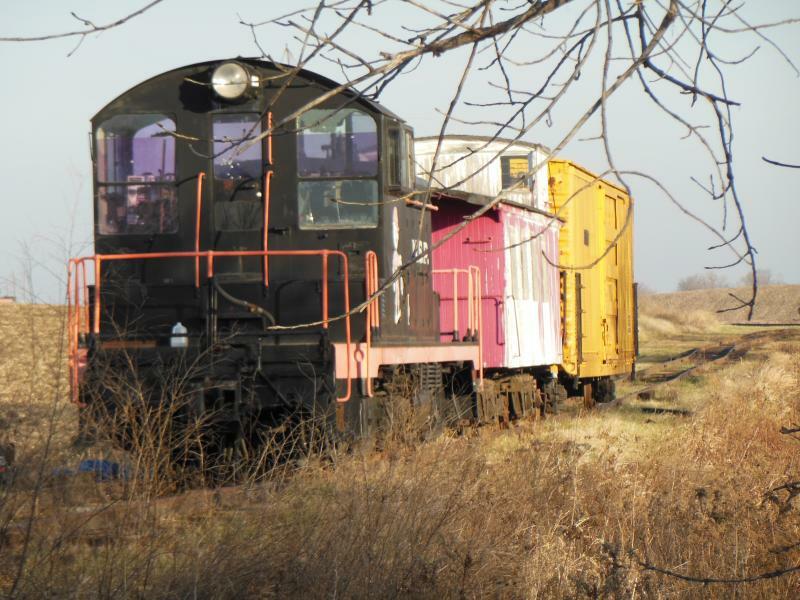 The goal for 2016 is to get MILW 992147 painted and placed into operation for caboose rides. Repairs to the draft gear are nearly complete and only a few more details need to be addressed on its brake system. 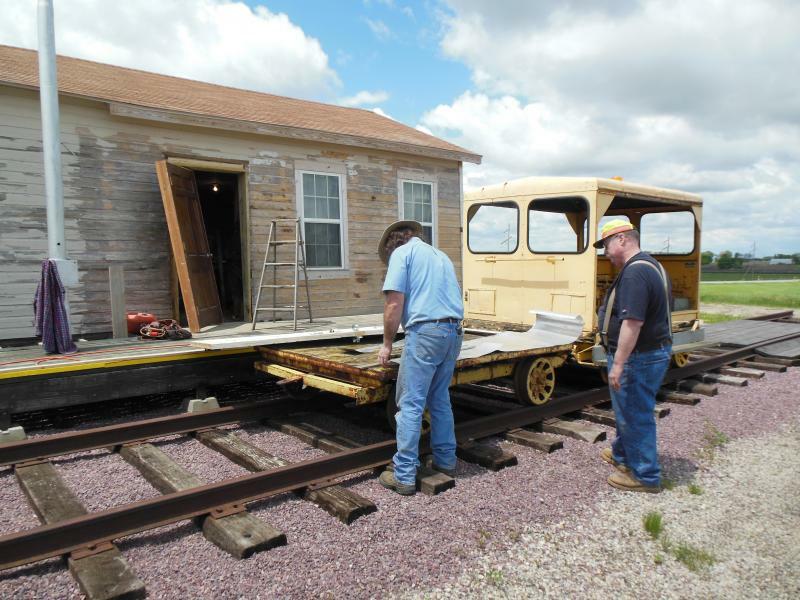 Volunteers are excited for the opportunity to add an operating caboose to its train rides. NSP4 could also use a much needed paint job. Time permitting, it too will recive a fresh coat of paint. In early spring 2015, NSP 4 was down with a leak in its cooling system. It was repaired in July,operated for GSRM's Annual Picnic and has been operating every Saturday since. 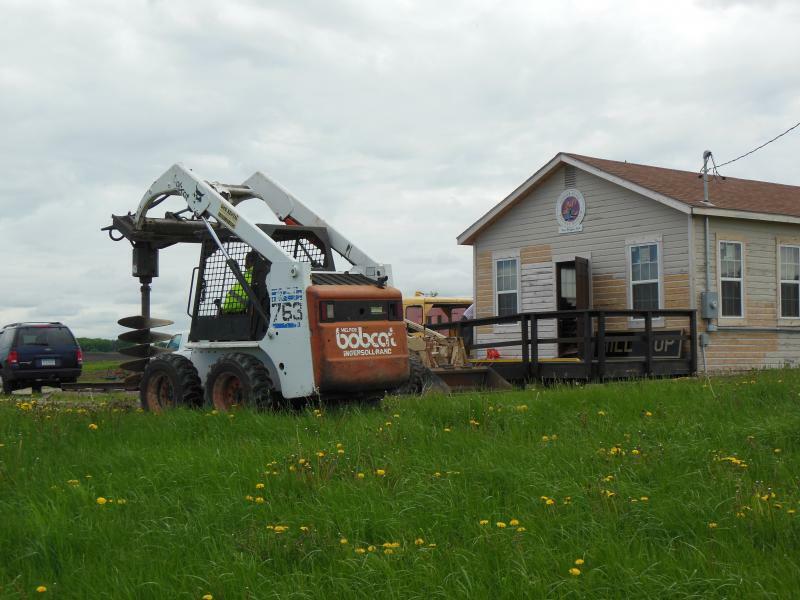 Volunteers have been working on Milwaukee Road caboose 992147 over the summer as well in order to get it ready to operate. The caboose had recieved some wreck damage prior to its acquisition by GSRM. A damaged draft gear was repaired along with a broken coupler and cut levers. Brake rods had been severed with a cutting torch prior to GSRM's acquisition of the caboose as well and those parts are being repaired or replaced. 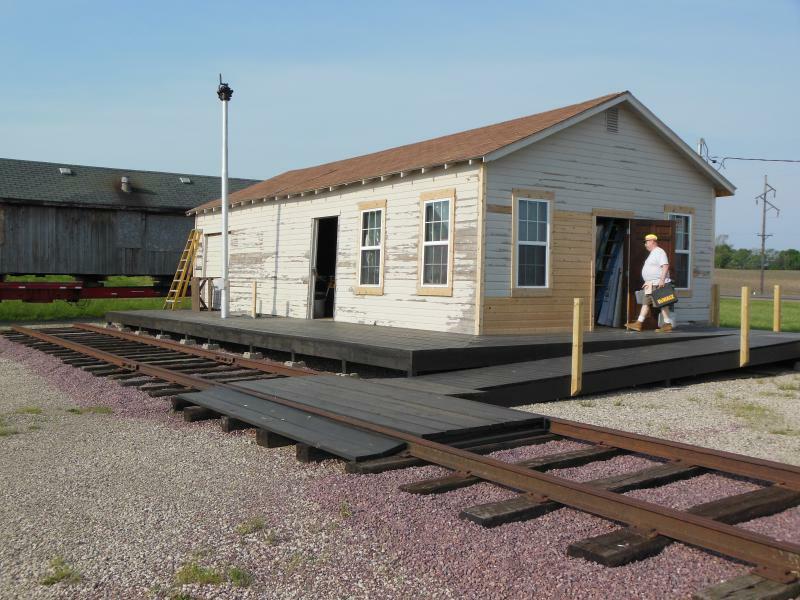 Volunteers should have the caboose operational before the end of the 2015 season. MILW 992147 will get a paint job in 2016. Volunteers have been busy during the Spring of 2015 giving CB&Q 14534 a much needed paint job. While not a complete restoration of the car, it will go a long ways in preserving it and making it look a lot more respectable for visitors until such time it can go inside a building for a more complete restoration. Windows will be re-installed on the left side after rotted superstructure is repaired from inside the car. As a part of our equipment organization project, we have begun extending our loop/storage track to reach the display area. 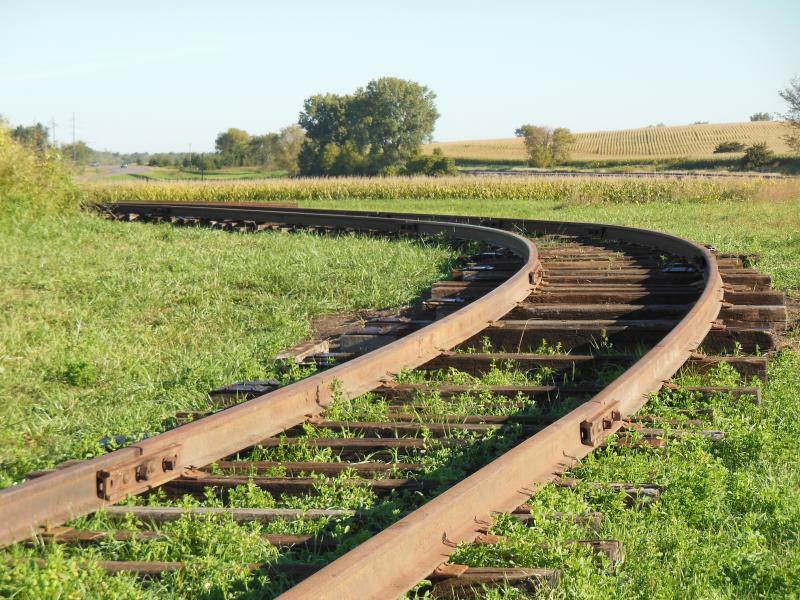 This project will constist of laying several hundred feet of track and several switches to connect to the existing display track, a second display track, and the loop track. More pictures and updates coming soon! As of early December, Hilltop 1 is complete and connected to the east side of the demonstration loop. It's partially ballasted (we ran out of ballast before we ran out of track, but more is on the way). We now have about 2/3 of a mile of continuous track, reaching approximately halfway around the perimeter of GSRM's property. 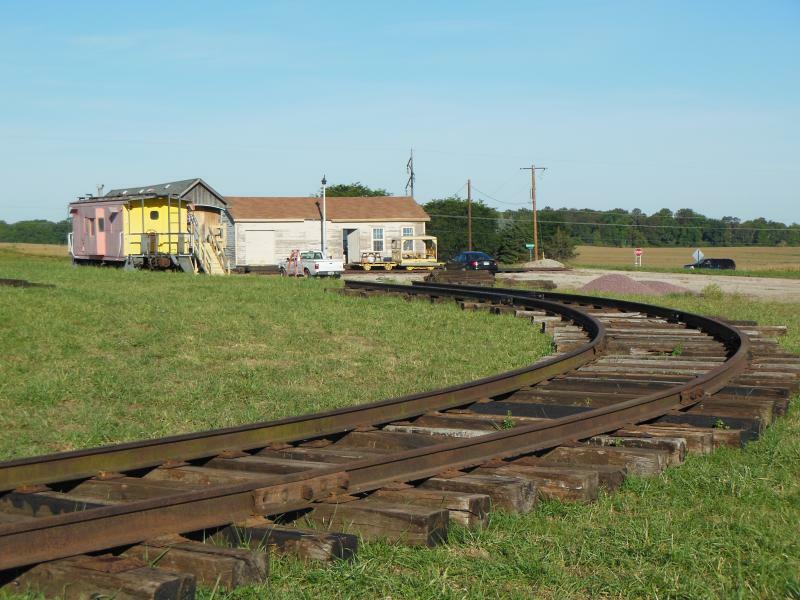 Our goal for 2013 is to complete the demonstration loop and build two switches in order to connect Hilltop 1 and Hilltop 2 to the loop. Starting in July 2014, volunteers undertook a project to realign the temporary track and improve the radius of the curve at the north end. 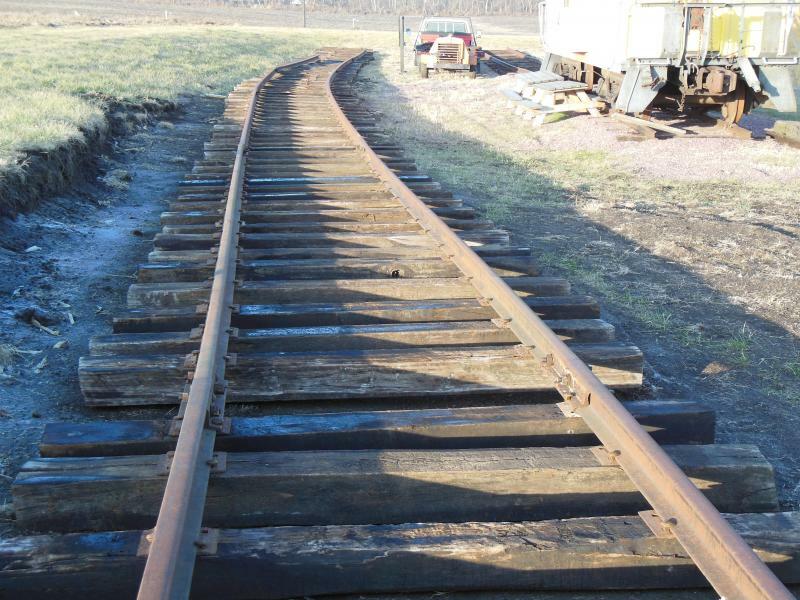 The project entailed dismantling the temporary track to Hill Top 1, easing the curve and realigning it to connect with Hill Top 2. 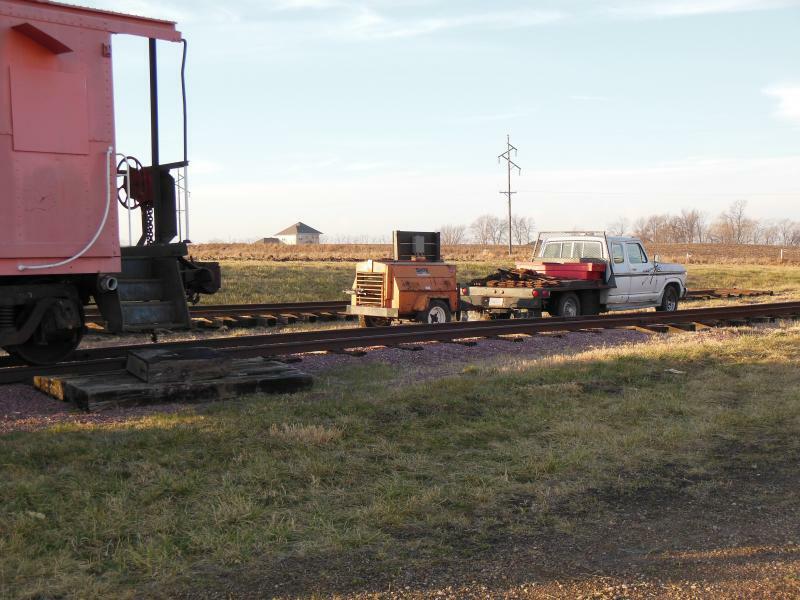 The permanent track will allow GSRM access to its Milwaukee Road caboose for operation of caboose trains in 2015 as well as parking NSP 4 near the depot and a source of electricity. You can veiw some of the track progress below. 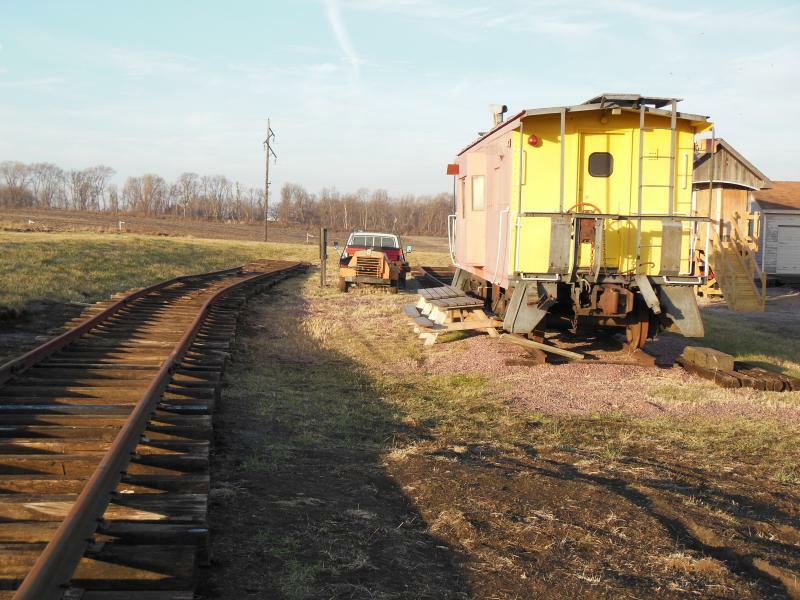 As of April, the rails are connected to Hill Top 1 where the Milwaukee Road caboose is stored! 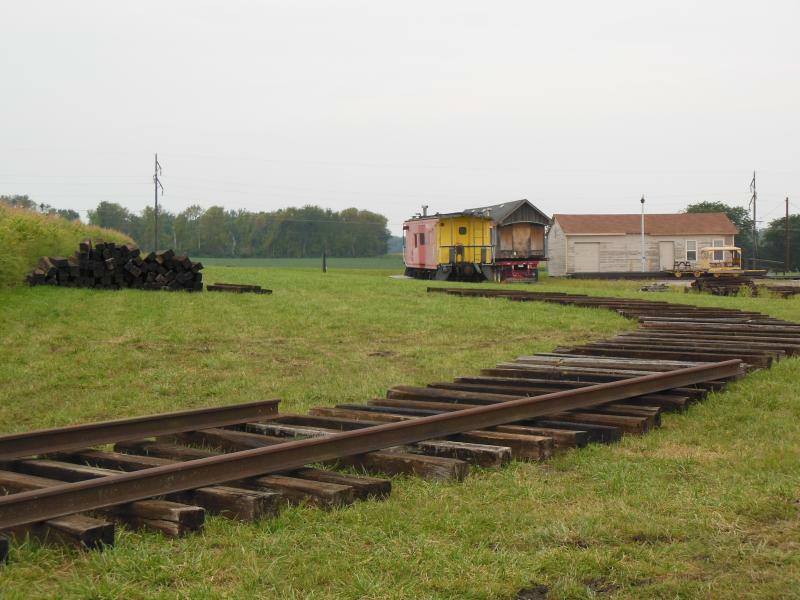 During the course of the summer, volunteers will be ballasting the track. 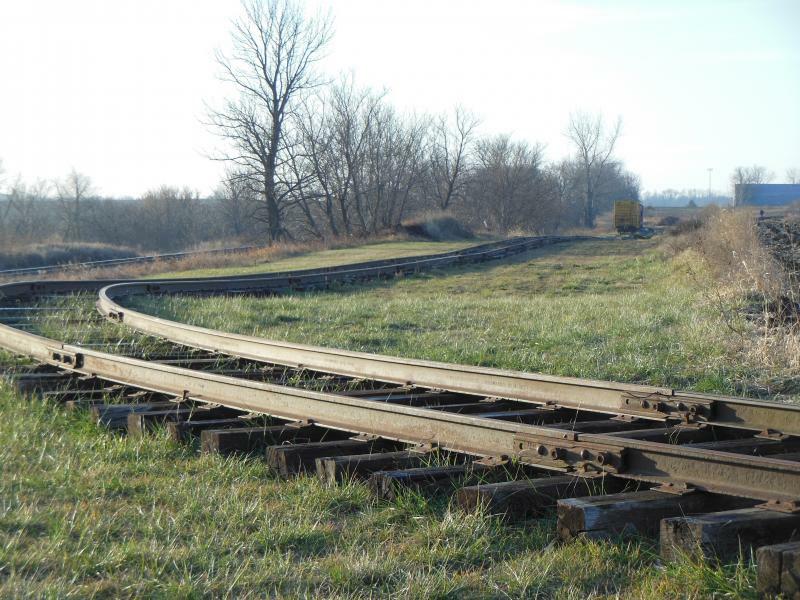 When complete, NSP 4 and the Milwaukee Road cabose will be able to operate from the Hill Top Depot a little more than 1/3 mile to the end of track at the south end of GSRM property. Volunteers were finally able to get some ballasting done. Another day of progress and the locomotive and cars can be operated across the connection to the Hill Top depot area. 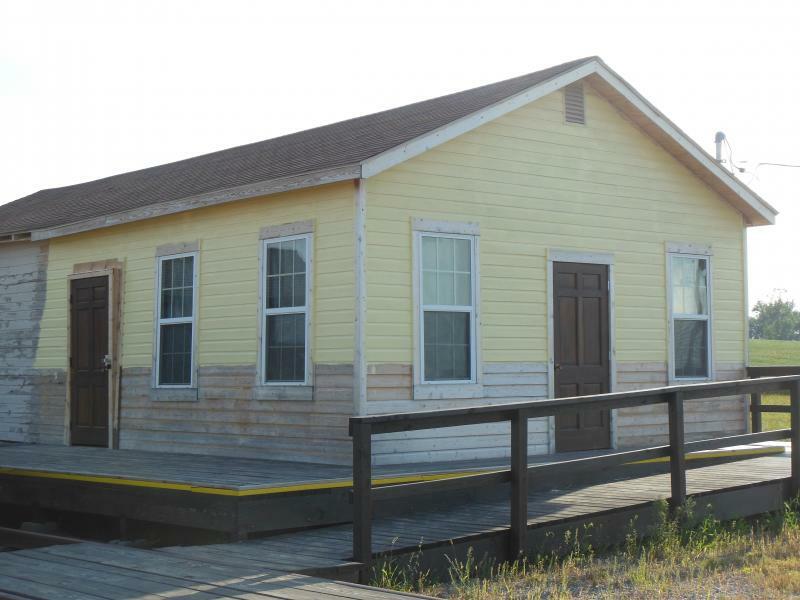 Our primary building is an old trackside structure that was moved in from the town of Kilkenny, MN. In its former life, it was used mostly for commodity storage. 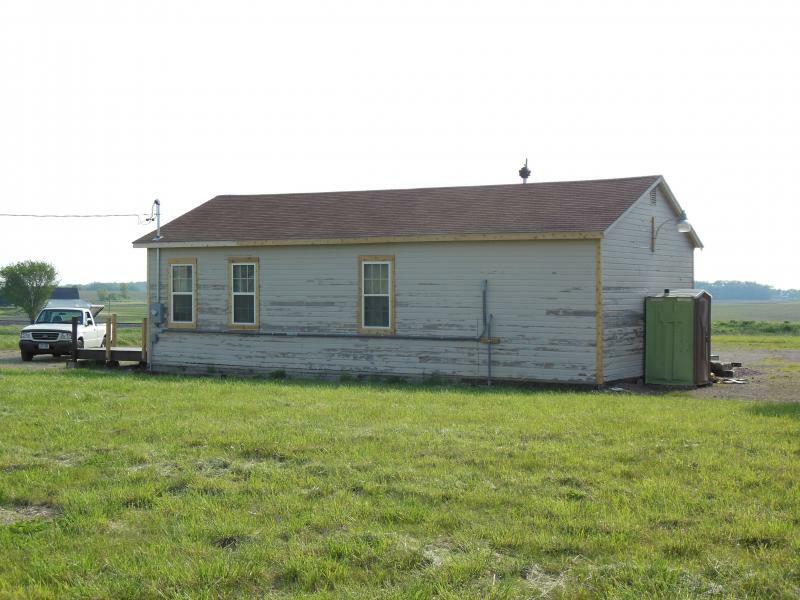 After the update is complete, it will represent a depot typical of a small farming community in the upper midwest. Also as a part of this project, the building will be made handicapped accessible. More pictures coming soon! As of early December, the depot platform is nearly complete. We're in the process of adding curbing and the railings on the handicapped ramp are done. The winter project will be adding a bay window and working on the interior. 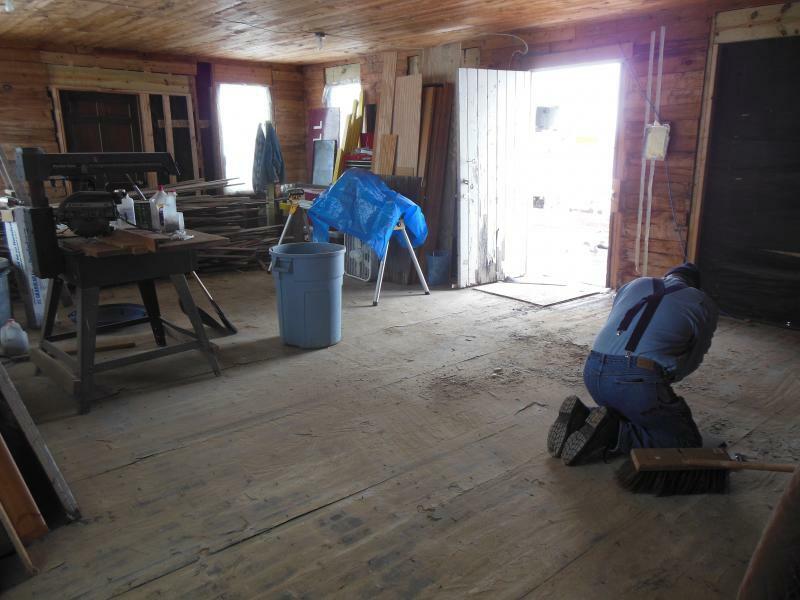 Work has been slow this spring, but volunteers have removed the old flooring in the "passenger" and"office" sections of the depot. The "freight" section will be left as is. It turned out the flooring was simply car siding turned upside down. Since it was a softer wood, mostly pine and some cedar, it was getting pretty worn and splintered. 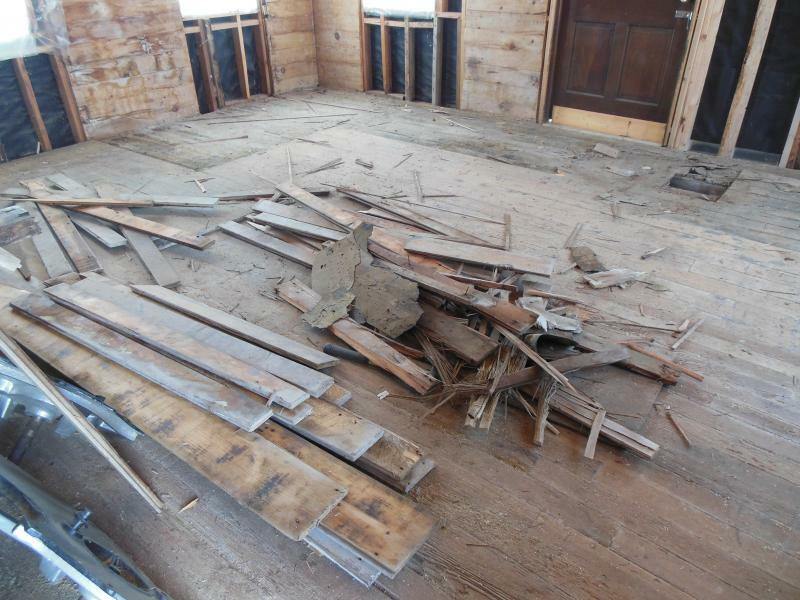 New flooring will be installed as interior work progresses. It's amazing how much dust and dirt can accumulate underneath the flooing over all the years. 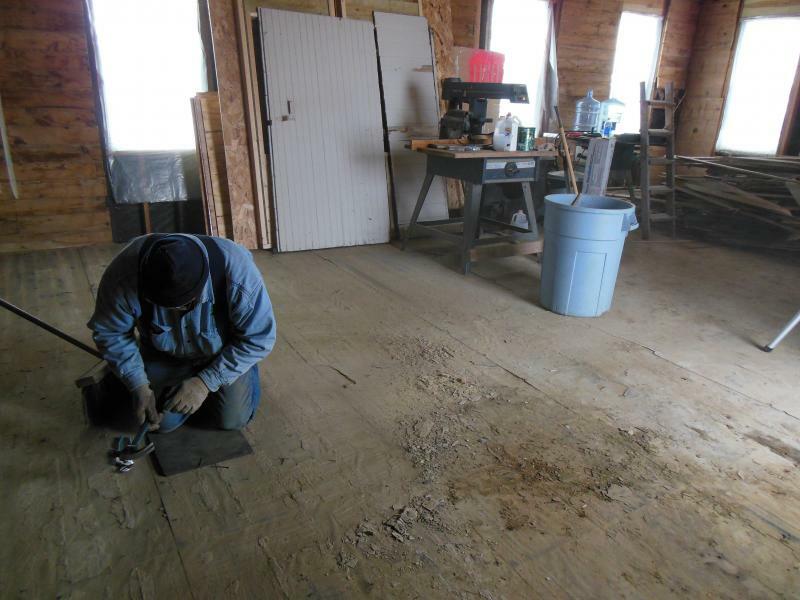 The subfloor is in surprisingly good shape and volunteers only found one spot by the north door that needs to be repaired. Summer doesn't seem to have made it to Minnesota yet despite a 100 degree day in mid-May. May closed out with record snowfall and record rainfall making progress on the depot slow. 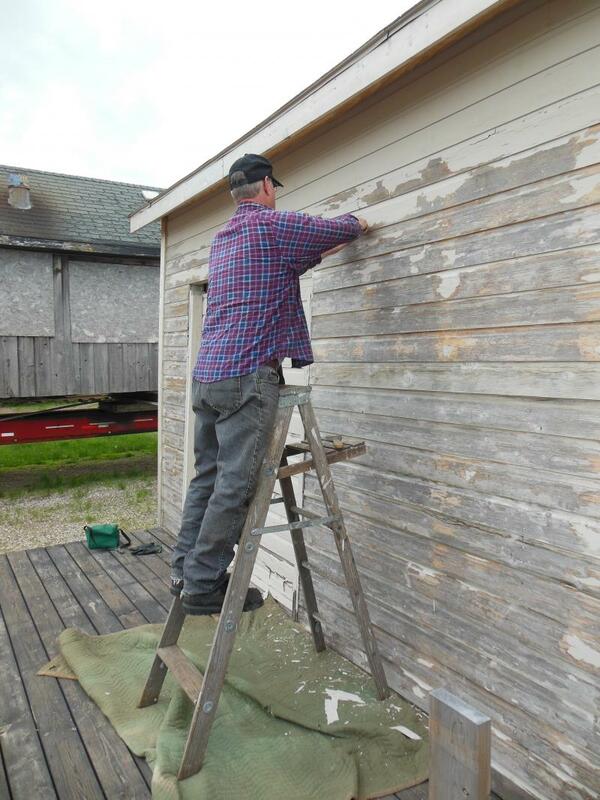 In spite of the weather, volunteers were able to make some headway in removing old paint from the exterior. 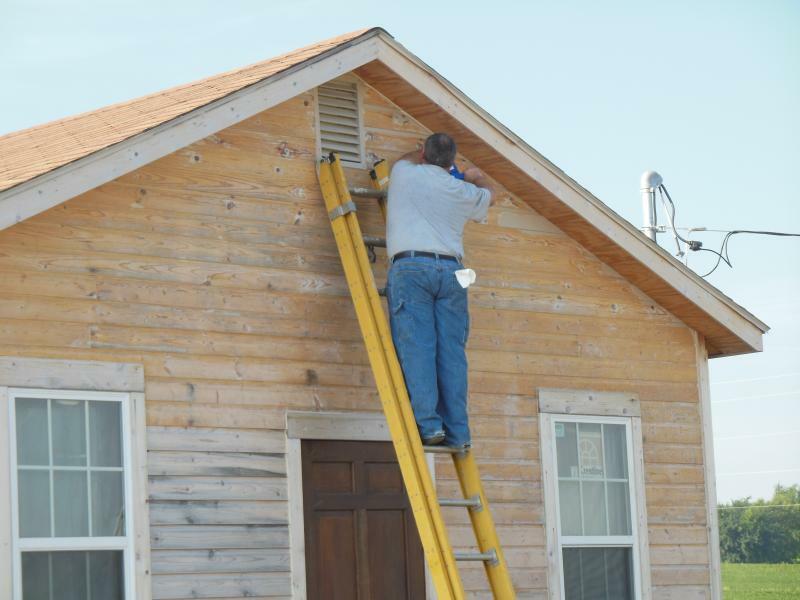 The depot color scheme will feature a gold (think Soo Line depot yellow) body with maroon trim as well as maroon from the bottom of the walls up to one board below the window trim. 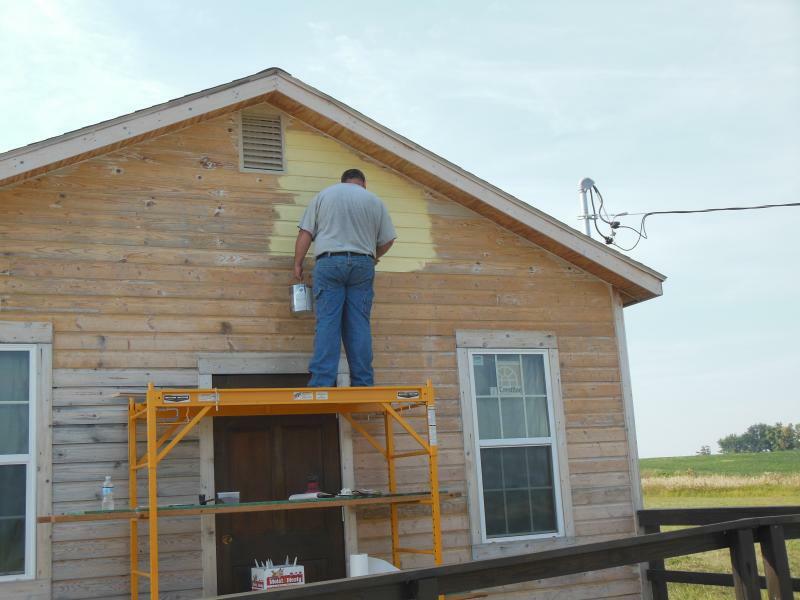 The goal is to get the depot exterior painted by July. Check back for updates to see if we make it. Why did we pick that color scheme when we're located on the former M&StL mainline and the Milwaukee Road also ran through the area? Why not an M&StL or MILW scheme? It was discused, discussed again, and discussed some more. 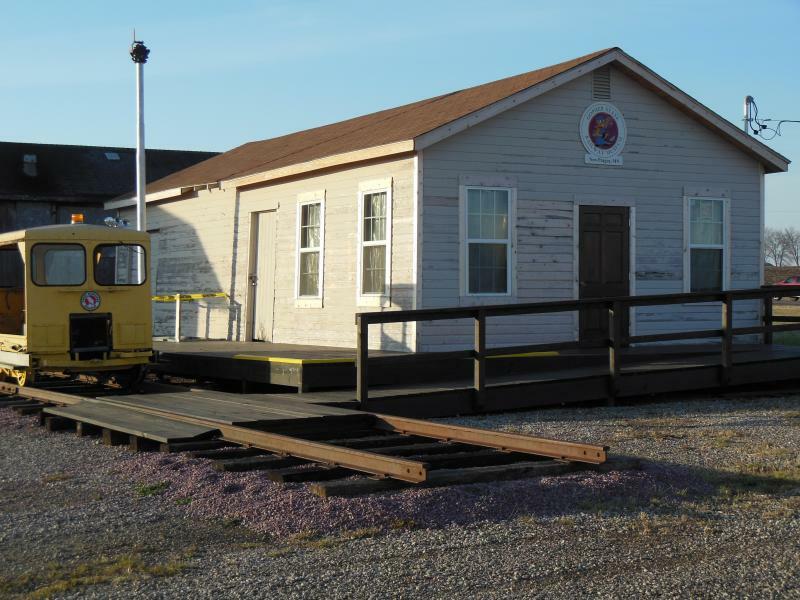 No consensus could seem to be reached until it was suggested GSRM had chosen maroon and gold as it's official colors, why not paint it in museum colors since the depot is a reproduction and doesn't depict any particular railroad company's depot? 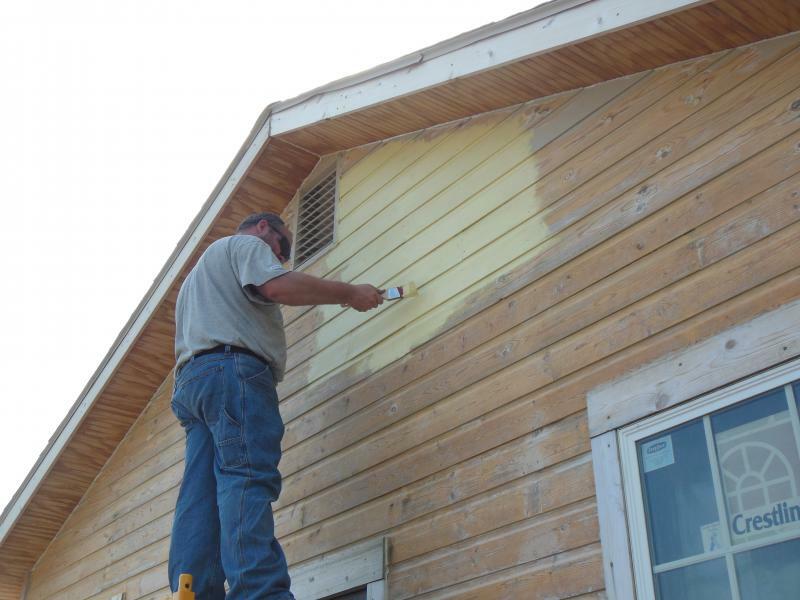 Everyone could seem to agree on that idea and paint chips were selected, paint bought and as soon as volunteers can finish stripping old paint, it will get a fresh new coat of maroon and gold. A new main entry door was also installed. With the addition of the appropriate hardware, it will comply with our building permit requirements making the depot handicapped accessible. 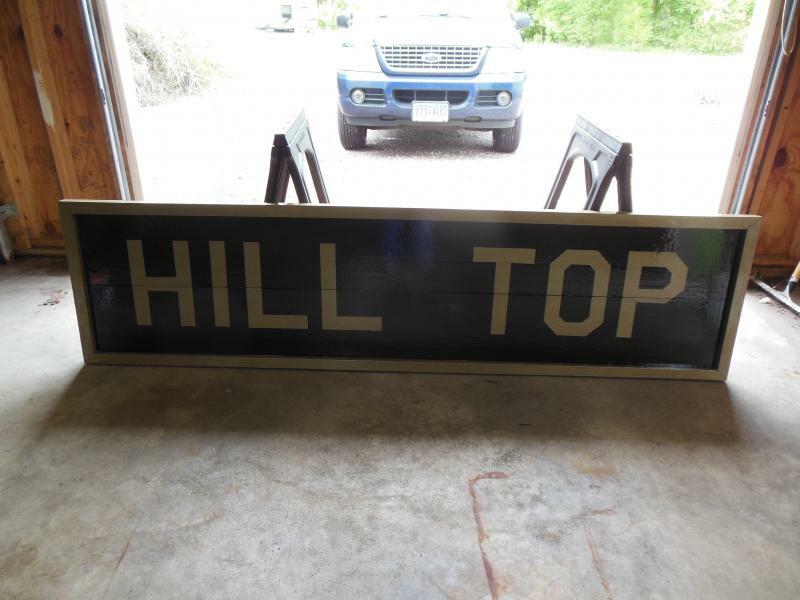 Original Hill Top depot sign found in volunteer's garage! 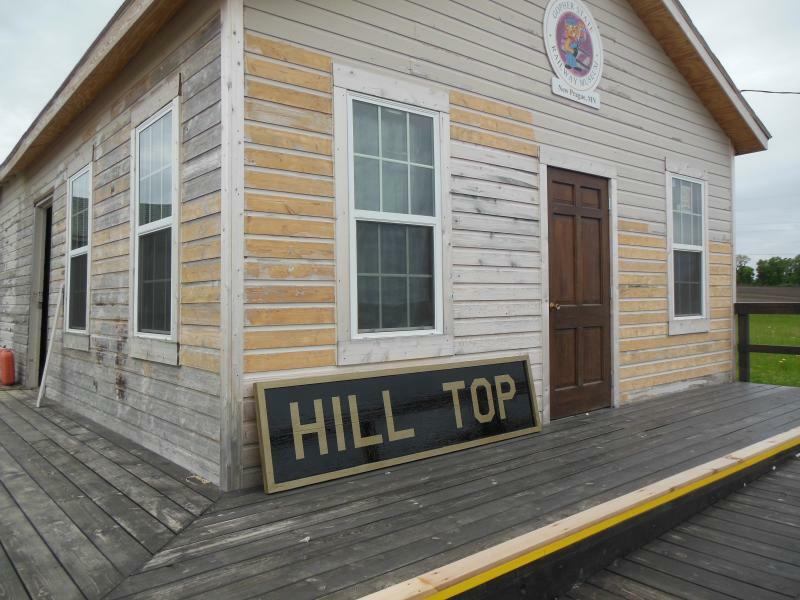 Well, "technically" it is the "original" depot sign since there never was a depot at Hill Top, but it was created by one of GSRM's volunteers to look like an old depot sign. It features 12" gold letters on a black field with a 1" gold border. A number of railroads denoted second class depots using gold letters on a black background instead of white lettering. The sign is built from cedar 1 x 12s. Flag Pole and flower garden. 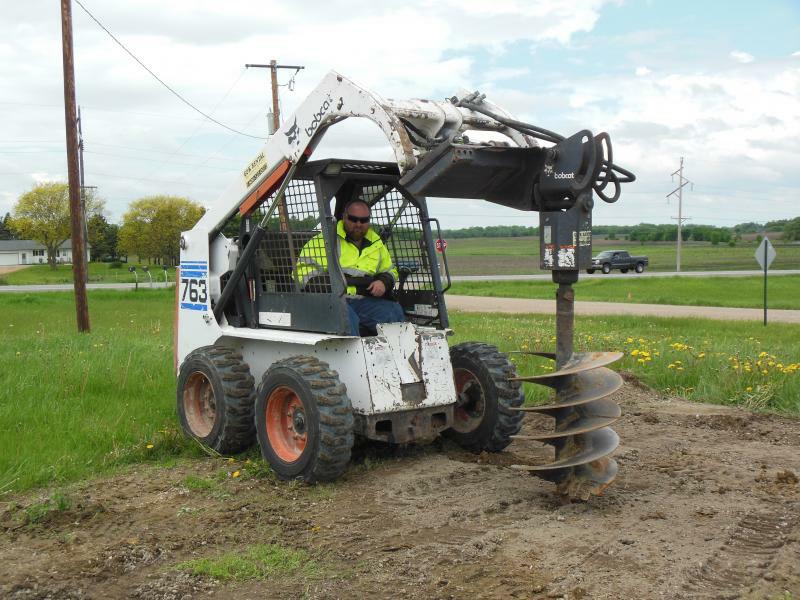 In 2012, the Elko, MN Lyon's Club donated $250.00 to GSRM to purchase and errect a flag pole and flower garden. Work was begun on the project 1Jun13. A hole was dug for the pole and in the coming weeks it will be set in concrete and garden edging built around the perimeter. Thank you to the Elko Lyon's Club for their generous donation to make this project happen. The flag pole and garden will be located just off the northwest corner of the depot, forming one edge to a picnic area. 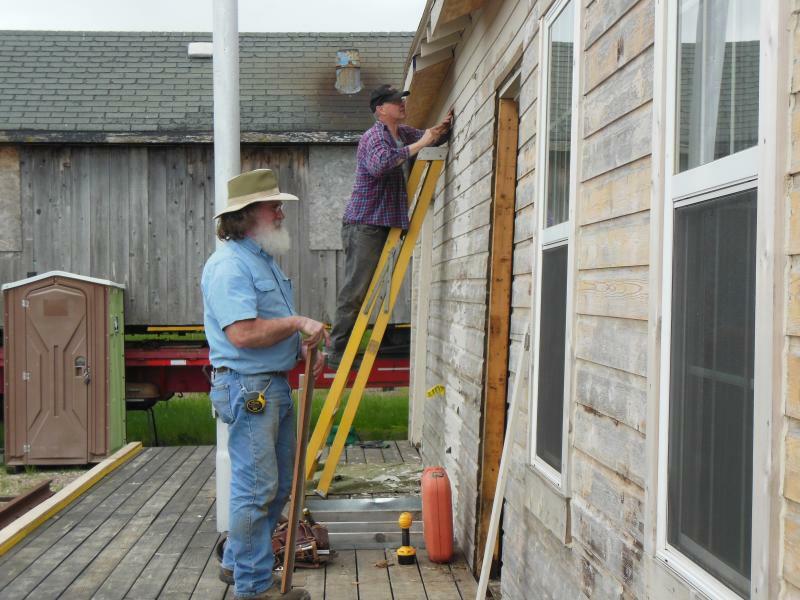 In spite of a rainy spring, heat an humidity in July and August, and a number of volunteers busy throughout the summer with vacations and family obligations, volunteers have finally begun painting the Hill Top Depot exterior. Scaping the old, peeling paint has been a slow process. Most of the west wall still needs to be scraped before it can be painted and part of the south wall, but about half the building has the fist coat of GSRM gold applied. The east wall is only painted up to the theoretical right edge of the bay window. To the left of the bay window still needs to be scraped. Check back soon for more updates as volunteers add the GSRM maroon trim and finish the job. The unpainted area below the gold will be maroon as well as the doors, window trim, faschia and other trim work. Well, the fall weather hasn't cooperated as well as everyone has liked. After a very dry August and September, October has seen its share of rain putting a damper on painting days. 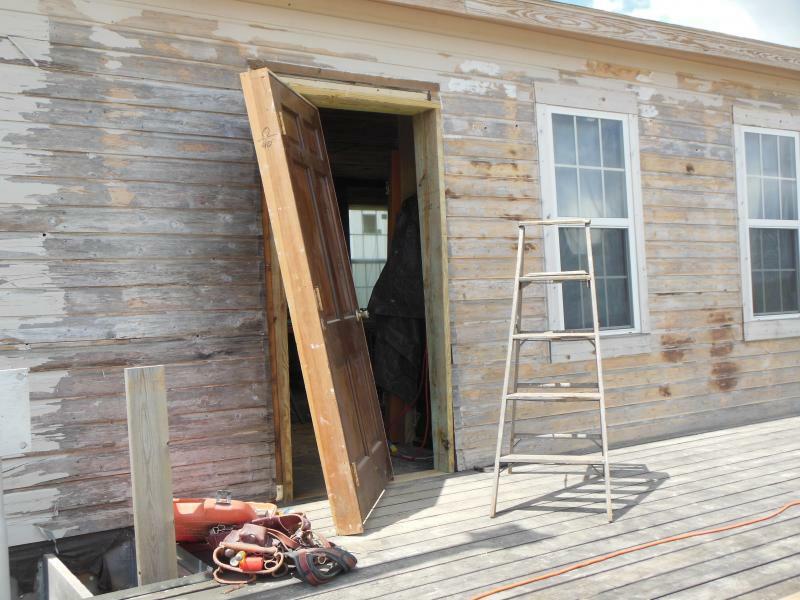 An absence of volunteers on a few weekends in October also slowed the progress on paint stripping. Unfortunately, we didn't quite reach our goal of painting the entire building before the end of October. The North and East walls are complete with the exception of a few details. The entire West wall still needs to be stripped of old paint. The South end managed to get one coat of gold paint on about 98% of the surface. It looks like winter is at hand in Minnesota and the temperatures aren;t going to cooperate for any more painting this year. Check below for the latest photos of the depot in its new colors. We may get the depot sign hung up yet this fall. Well - it's already mid-November and the painting season is over with. Volunteers managed to get the north and east walls painted before it got too cold to do any more painting. It looks good so far, but it will look even better next summer when it's finished. 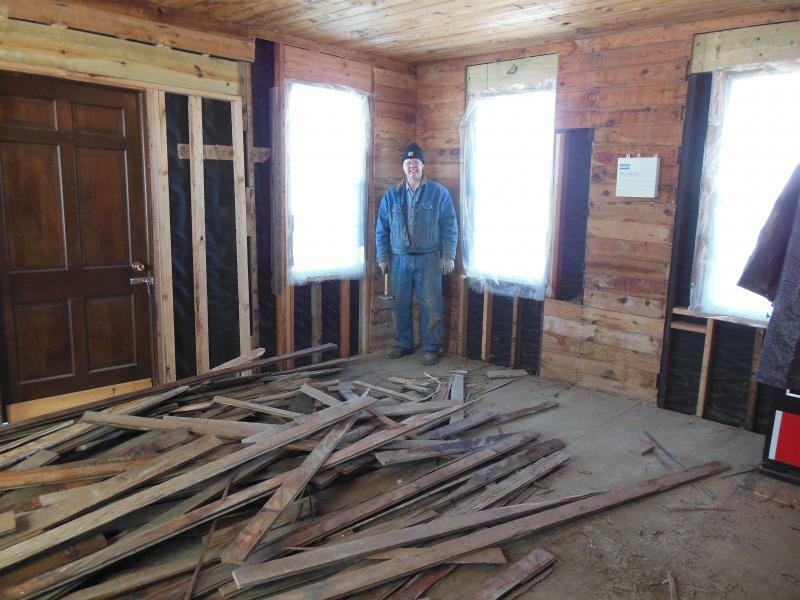 Volunteers have been working inside now, getting ready to put up paneling on the walls and ceiling and trim the windows. 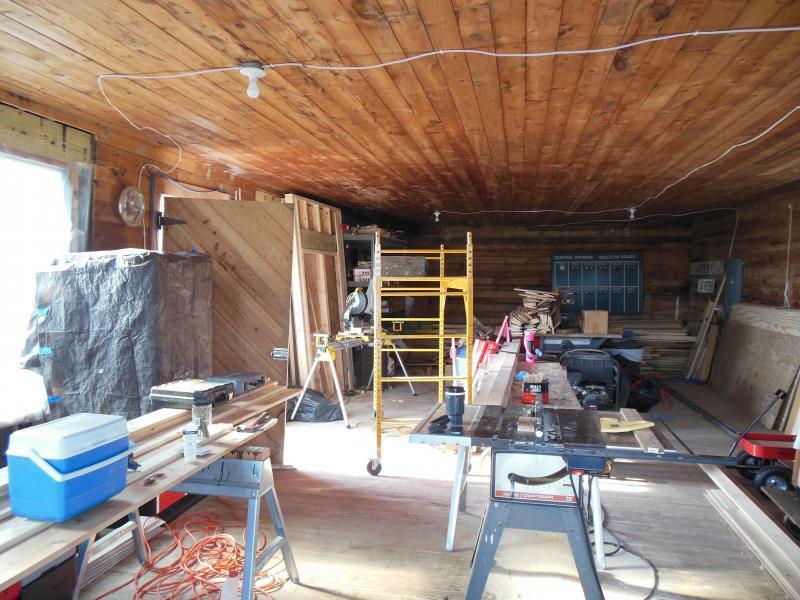 Check back for December updates on how the interior is progressing. Meanwhile, here's some photos of the exterior progress. We've been having "real" Minnesota winter this year. Temps dropped below zero in mid-December and have hovered there for nearly three months. 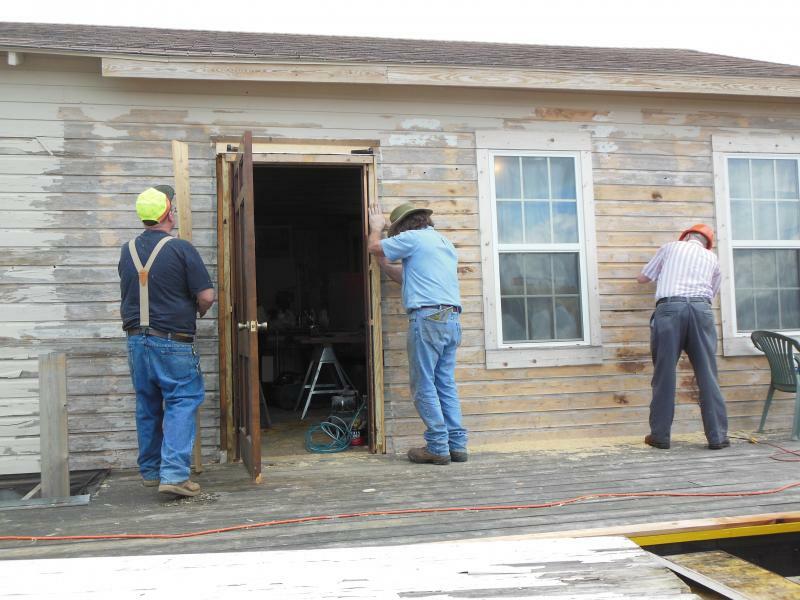 In spite of the cold and snow, volunteers have been continuing their progress on the Hill Top depot. The interior is starting to take shape. Wall panelling has beengoing up to simulate wainscotting and two windows have been trimmed so far. 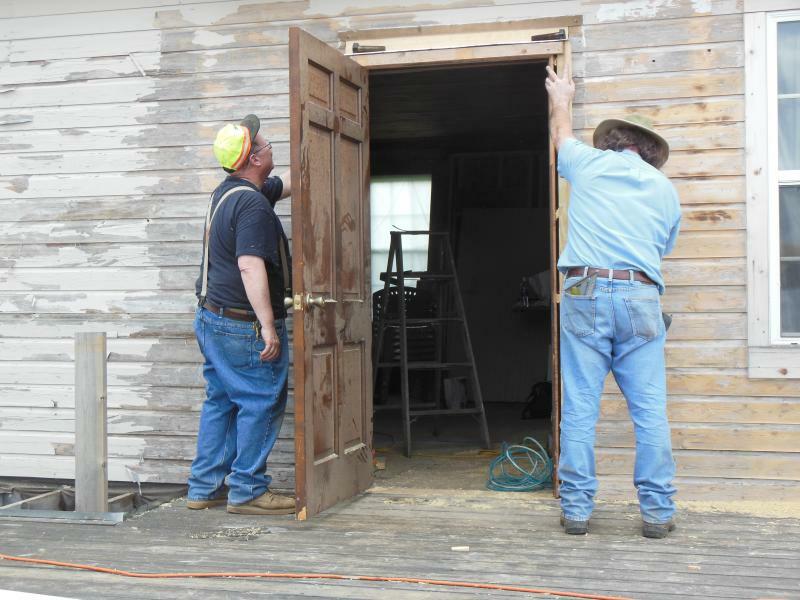 Two new interior walls went up dividing the building into a waiting room, operator's office and freight room. A ticket window and ticket counter are in process. Hopefully March will be warmer and the workpace will pick up a bit. 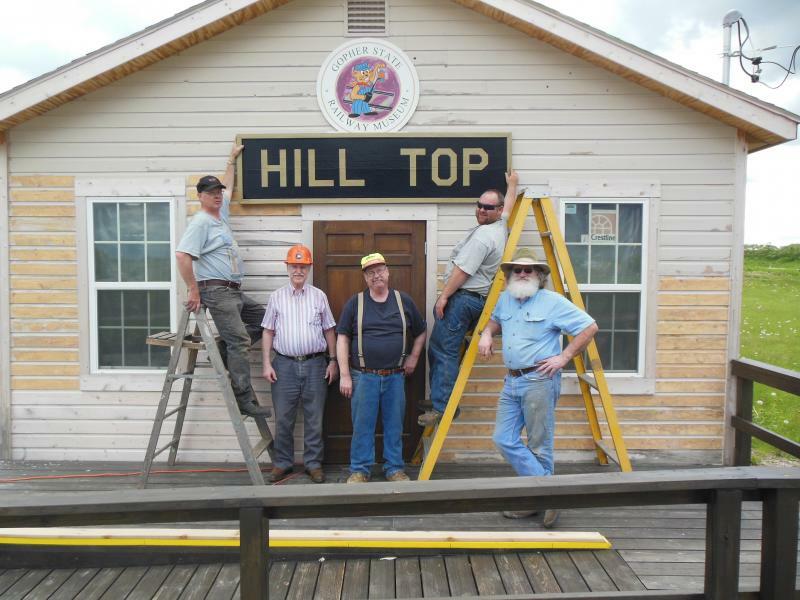 Volunteers keep plugging away at the Hill Top Depot. The waiting room is completely paneled and only one window is left to trim. Ceiling cove molding was installed Easter weekend and it really makes a difference in the appearance of the waiting room. As soon as winter decides to leave us for spring, and overnight temperatures remain above the 40s, volunteers will begin painting the waiting room. The interior color scheme will be a white ceiling, cream colored walls and a milk chocolate color on the trim, the chair rail and below the chair rail. Next project is to build and install the ticket window in the rough opening. 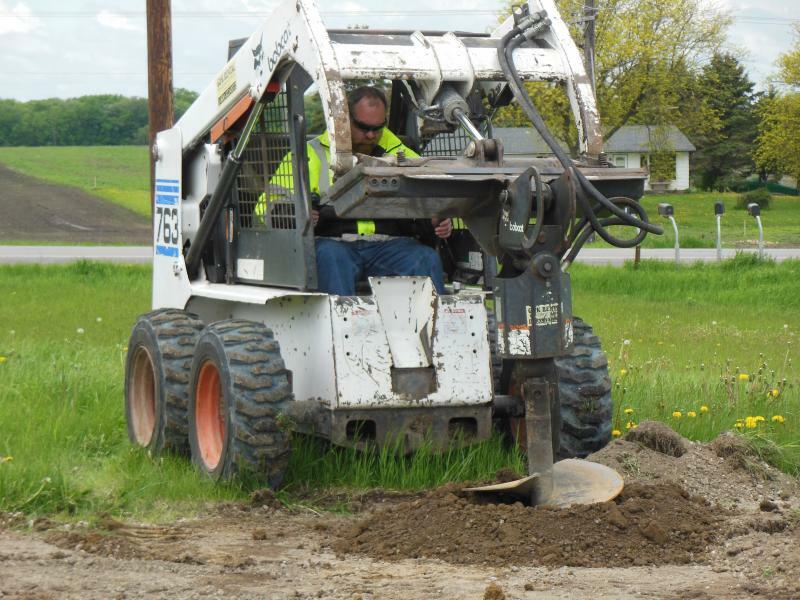 It's been a wet spring and early summer in Minnesota with June going down in the books as one of the wettest on record with much of the state seeing flooding and landslides. 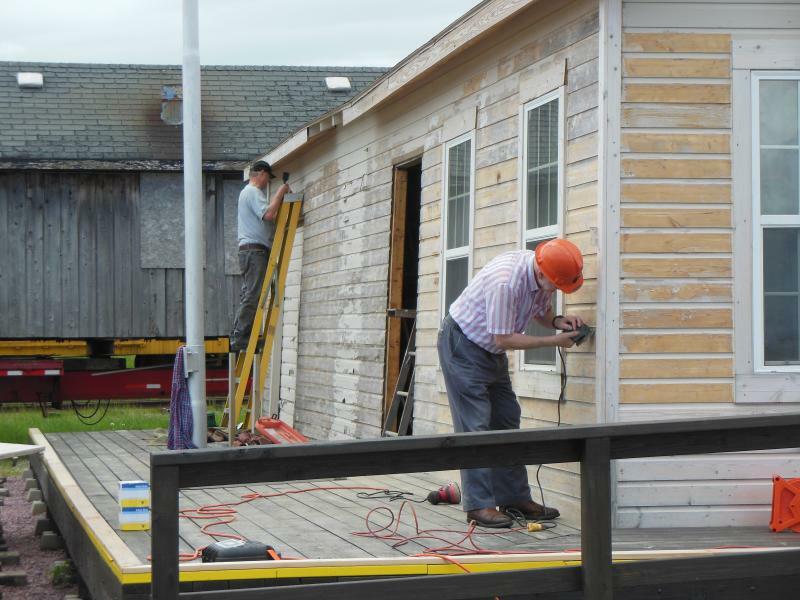 In spite of the wet weather, GSRM volunteers have been busy working on the Hill Top Depot. Except for some trim work, the whole exterior finally has at least one coat of maroon and gold paint on all for walls! 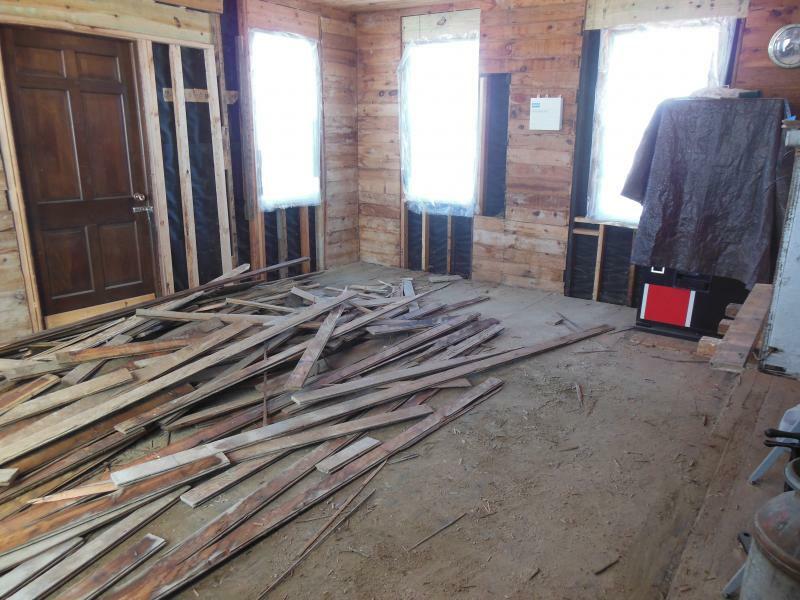 On rain days, volunteers have been working on the interior. The waiting room is about 85% complete. 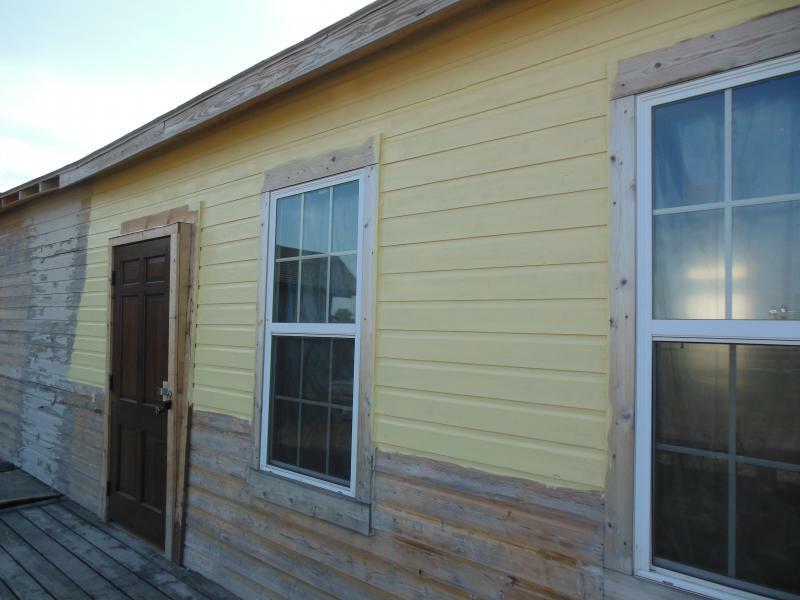 As of 12Jul, all four walls are panelled, windows trimmed and the walls and trim is painted. The ceiling also has the first coat of white paint. The photo below is 6Jul after painting the first coat of paint on the ceiling. As can be seen, we now have window shades in the waiting room as well rather than plastic sheeting covering the windows. After moving in several pieces of equipment by truck a few years ago, we are now moving some of them into place to be used in our displays over the summer. 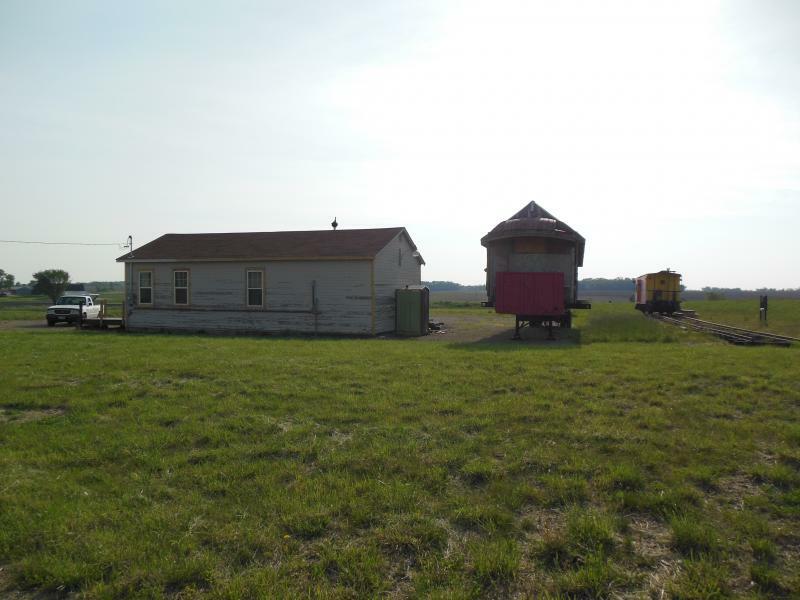 Above: NSP 4 (a 1940 EMC SW1) CB&Q 14534 (an 1871 Burlington waycar) and our 50 ft shop boxcar are seen after being moved to our new siding at the south end of the property. 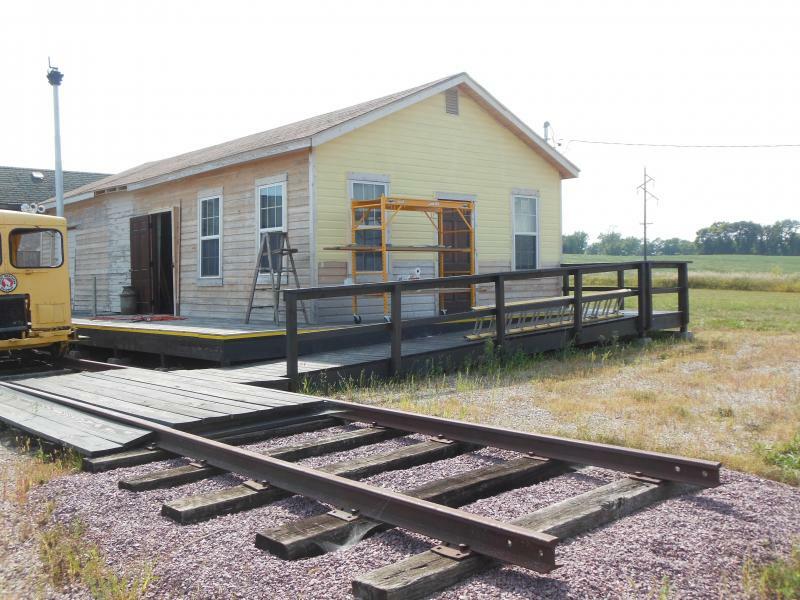 When the siding is completed as far as the depot at the north end, the equipment will be moved up there for display and operation. We've completed Hilltop 1 and connected it to the loop track. It's not completely finished with ballast and leveled, but we'd like to get SRBX 23 and possibly CB&Q 14534 moved north, if not all the way to the end of the track this weekend (8Dec12). Unfortunately the weather may not cooperate as winter threatens to finally arrive in central Minnesota this weekend with up to 3 or more inches of snow. If we're successful in moving the equipment, it will be close to electricity and we can start setting SRBX 23 up as our shop car. See "SRBX 23 Move" and "CB&Q 14534 Move" pages for the latest update. Building a railroad the "hard" way. 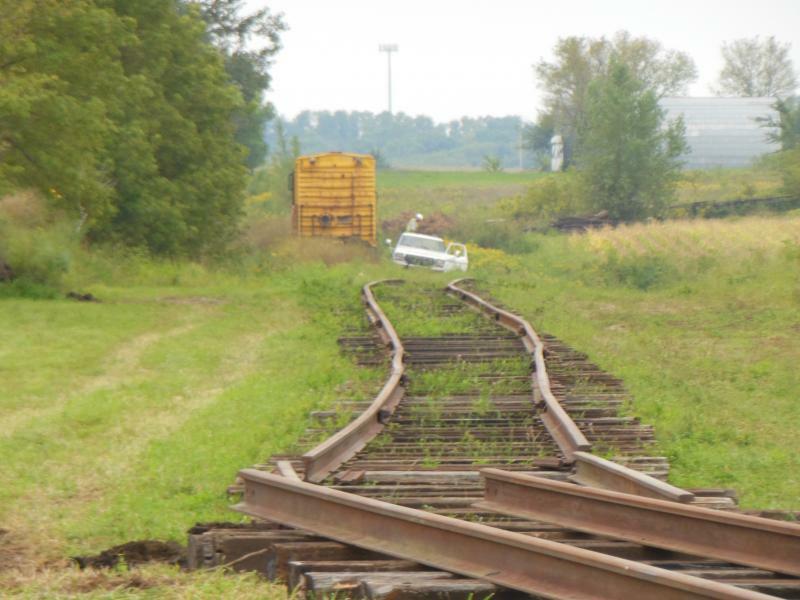 When the former Minneapolis & St Louis (UP) line between Merriam Junction and Chaska, MN washed out in 2007, it left three pieces of GSRM equipment stranded at United Sugars where it was stored. Diesel locomotive NSP 4, CB&Q waycar 14534 and GSRM's shop box car were moved to the museum property in 2009 by truck at the expense of selling GSRM's prized, fully operational, former Green Bay & Western RS3 (it went to a good home and is well cared for - but we were sad to see it go) to cover the cost of the move. 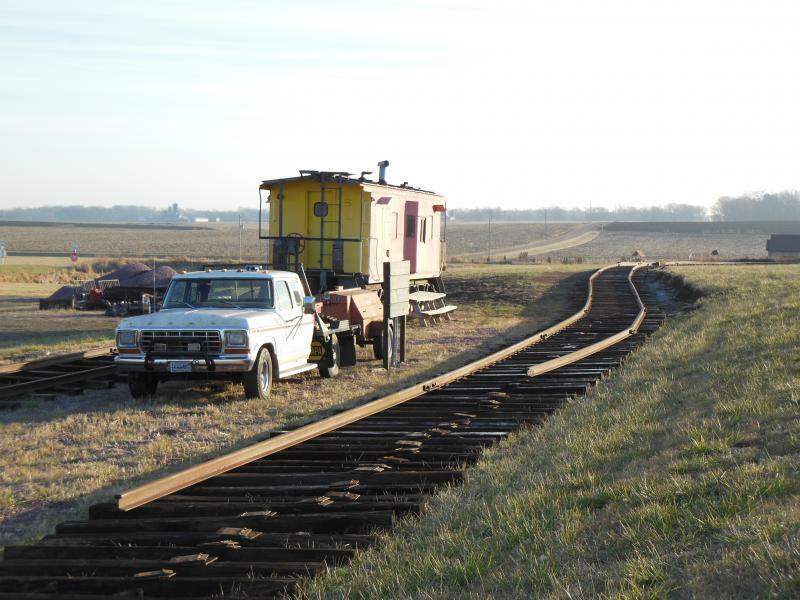 A short section of GSRM's siding was built to unload the waycar and box car and NSP 4 was placed on a short section of track about 75 yards east and perpendicular to the siding where it was easier to maneuver the semi-truck and trailer. 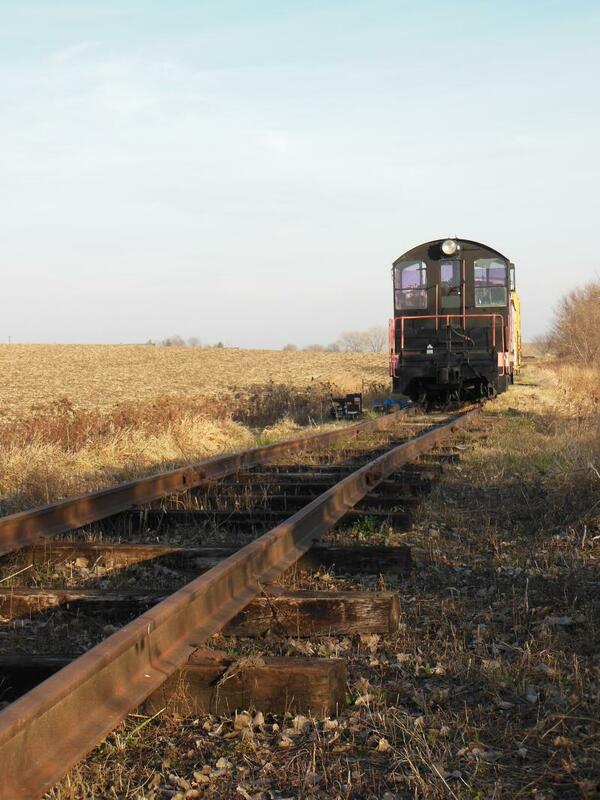 Volunteers started buidling temporary track late summer 2011 in order to move NSP 4 to the siding to join CB&Q 14534 and the shop car. 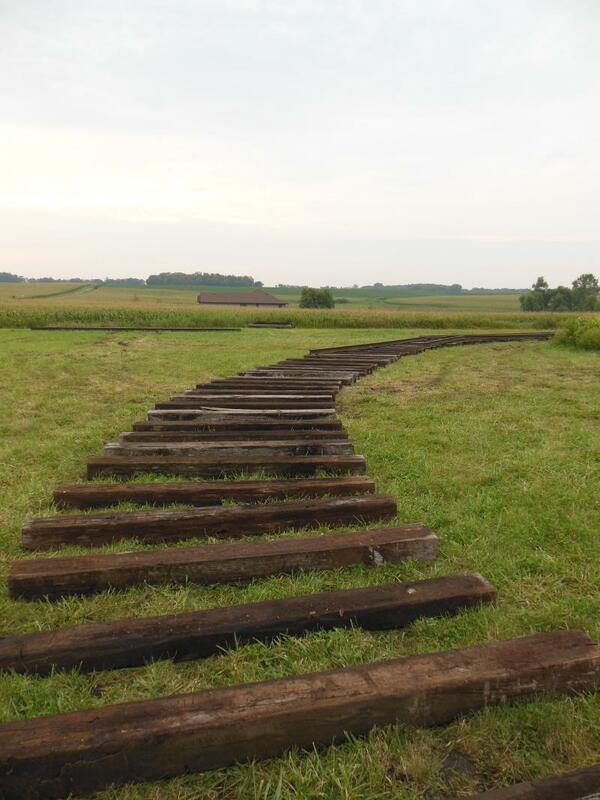 In the spirit of an old logging railroad, ties and rail were laid right on the ground. 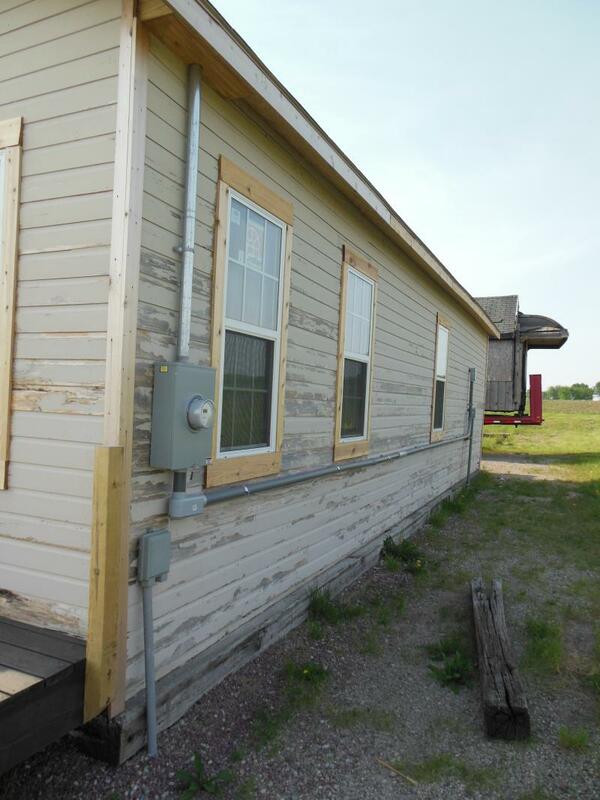 A sharp curve was required to reach an alignment with the siding. 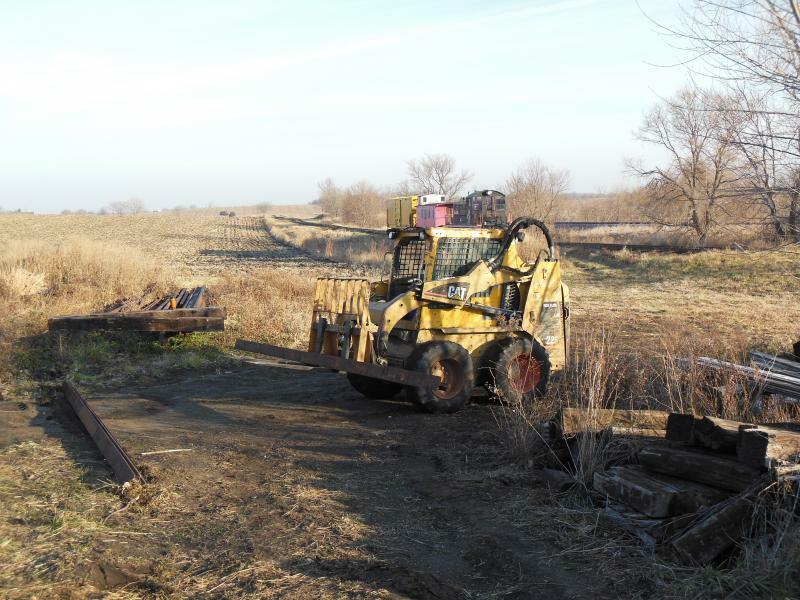 Since NSP 4 wasn't yet operational again after moving it by truck, a bulldozer was employed to move it. A gas powered air compressor provided a source of charge air for NSP4's air system so its brakes were available. Accompanied by a fair amount of creaking, groaning and squealing flanges, the little SW1 arrived at its destination, end of track about 150 yards to the southeast. 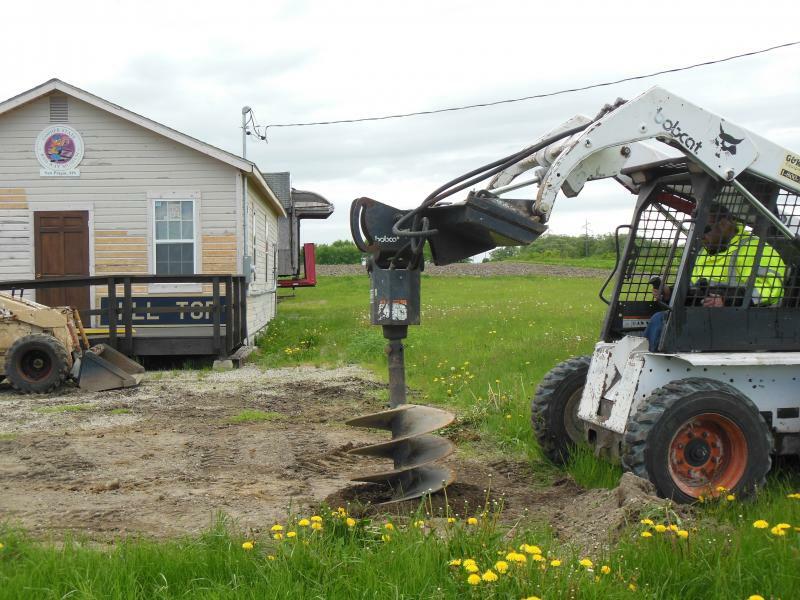 Next the track was lifted in panels using the bulldozer blade to pick it up and placed in alginment with the siding. The whole process started again with the Caterpillar urging NSP 4 along and the compressor providing a means to stop before anything negative happened. Preperation and teamwork ensured a smooth movement and NSP 4 arrived safely on GSRM's siding in mid-December 2011. But there are better ways to run a railroad than 100 yards at a time.